Text: Origins. During the tumultuous religious upheaval of the Reformation, a group of British Protestants migrated to Geneva, mostly for the purpose of escaping the wrath of Queen Mary I (reigned 1553-1558). While in Geneva, the English Protestants learned from the French disciples and colleagues of Jean Calvin, (1509–1564), who had been preparing a complete metrical paraphrase of the Psalms. As a basis for the English edition, the Reformers used the work of Thomas Sternhold, a former “groom of robes” of King Edward VI (reigned 1547–1553). “All people that on earth do dwell,” a metrical paraphrase of Psalm 100, was contributed to the effort by William Kethe (d 1594), one of the Anglo-Genevan reformers, and first published in five stanzas in Foure score and seuen Psalmes of Dauid in Englishe mitre (Geneva, 1560/1), which was appended to The forme of prayers and ministration of the sacraments, &c. vsed in the English Congregation at Geneua. 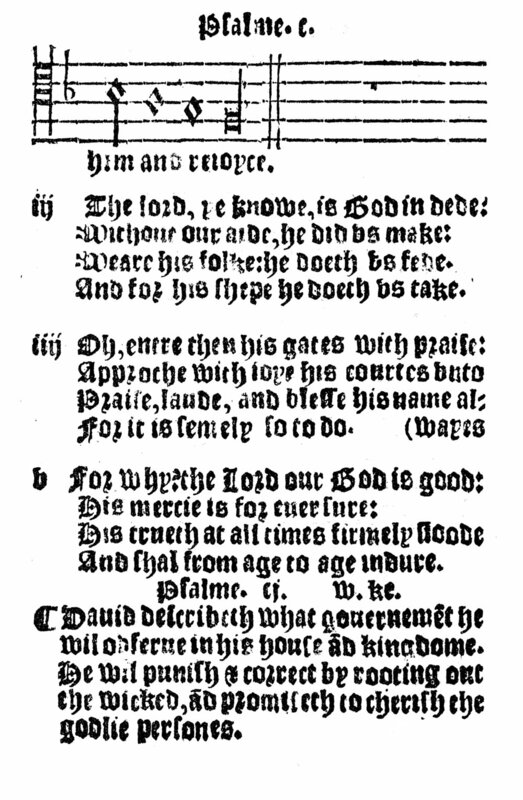 This version of the psalter was reprinted in London in 1561 (Fig. 1). Fig. 1. Foure score and seuen Psalmes of David in Englishe mitre (London, 1561). In the first complete edition of the English psalter, The whole booke of Psalmes collected into Englysh metre by T. Starnhold, I. Hopkins, & others (London: John Day, 1562), Kethe’s paraphrase was replaced with “In God the Lorde be glad and lyght” by John Hopkins. For unknown reasons, subsequent editions reverted to the paraphrase by Kethe; Kethe’s text has found an enduring place in English hymnals ever since. Text: Development. Some hymnals and psalters carry a revised version of the text from the Scottish Psalms of David in Meeter (Edinburgh, 1650 | Fig. 2). In this version, the line “Him serve with fear” has been changed to read “Him serve with mirth,” which better reflects the text of Psalm 100:2, “Serve the Lord with gladness” (KJV, 1611). Kethe’s line, “The Lord, ye know, is God indeed,” was changed to “Know that ye Lord is good indeed,” although this was corrected later back to God, in keeping with the Scripture. In Psalm 100:3, the KJV English reads “we are his people,” which is represented in Kethe as “we are his folk,” whereas the Scottish gives “we are his flock,” reflecting the subsequent phrase about sheep. Fig. 2. Psalms of David in Meeter (Edinburgh, 1650). Tune. The tune used by the English reformers for Psalm 100 was borrowed from the French psalters, where it had been used for Psalm 134. The melody is generally credited to French composer Loys Bourgeois (ca. 1510-1559), and it was first printed in Pseavmes octantetrois de Dauid mis en rime Francoise (Geneva, 1551 | Fig. 3). The French paraphrase is by Theodore Beza (1519–1605). In some hymnals, the tune has appeared with its French designation, GENEVAN 134. In the English psalters, it was first printed as PSALM 100 in the Anglo-Genevan Foure score and seuen Psalmes of David (1560/1 | Fig. 1 above). Fig. 3. Pseavmes octantetrois de Dauid (Geneva, 1551). In the English tradition, the tune was originally known simply as PSALM 100, but it came to be called OLD 100TH (OLD HUNDREDTH) following the publication of the New Version of the Psalms of David by Nicholas Tate and Nahum Brady in 1696 and subsequent attempts by composers to write new tunes for this Psalm. It was first dubbed “Old” in J. Boyse, Family Hymns for morning and evening worship. . . . All taken out of the Psalms (Dublin: Matthew Gunne, 1701). This tune is sometimes known colloquially as “The Doxology,” owing to its frequent pairing with the text “Praise God from whom all blessings flow” by Thomas Ken (1637–1711). Erik Routley, “All people that on earth do dwell,” Hymns and the Faith (Greenwich, CT: Seabury Press, 1956), pp. 19-22.